With seven bath/shower rooms, Poyntzfield House is ideal for a shared economical holiday. With an outdoor heated swimming pool, and a full size antique snooker table in the games room, all that's needed is you! 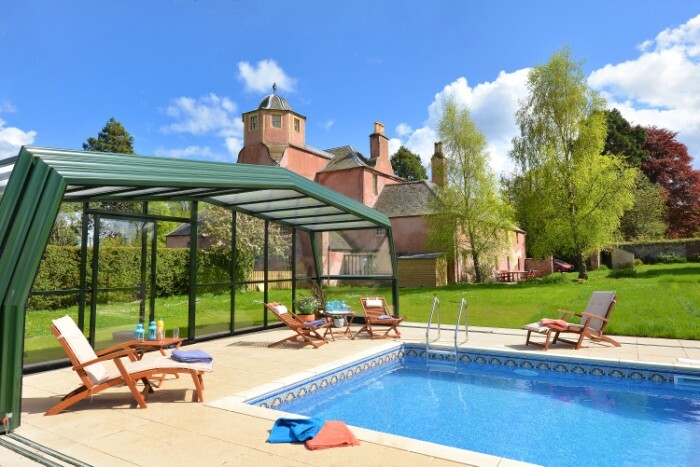 Situated just a 30-minute drive from Inverness, on the rich farmland of the Black Isle, Poyntzfield is a particularly good self-catering house, large enough for groups and families with lots of children who are made most welcome. A great atmosphere reigns here: pets are welcome by arrangement, and roaring log fires welcome you home after a day on the hills. Inverness offers the usual facilities associated with a popular tourist city, and cruises on Loch Ness to Urquhart Castle are recommended. The outdoor sports resort of Aviemore is just over an hour's drive away, as is Ullapool and the west coast. The Black Isle greatly rewards exploration and offers pony trekking, sea angling, bike hire, golf, and dolphin watching cruises. In fact, the dolphins can be seen from the shore in Fortrose each day as they follow the shoals of fish up the firth on the incoming tide. At Rosemarkie you will find a sandy beach, children's playpark and tennis courts. Cycling has become particularly popular on the Black Isle, as the roads are quiet for those who like to travel far and wide on road bikes, and the whole peninsula is criss-crossed by tracks and trails for mountain bikes. In 2005, a new cross-country/downhill track was developed on the south side at Learnie and this presents some challenging routes. Eathie beach along the coast is also quite famous for its fossils, examples of which can be seen in the Hugh Miller Museum in Cromarty. Summer visitors will appreciate the very low midge population! The accommodation comprises the main part of the house and the west wing which are connected on the ground floor, but the higher floors are accessed by separate staircases. The caretaker and family lives in the east wing (no interior connection).